At the recent 2014 Apfelwein Weltweit (2014 Apple Wine World Wide) event in Frankfurt am Main, I was surprised to spot among the apple wine, (hard) cider, cidre, sidra producers from Germany and other European countries Weingut von Racknitz, which is an up and coming wine producer, owned and run by the husband and wife team Louise von Racknitz-Adams and Matthias Adams. Indeed, Matthias Adam had brought to the event 4 of his excellent wines, made out of grapes, but he had also brought a lightly sparkling apple wine, made out of apples: NV Apfelperlwein Glasperlenspiel. Weingut von Racknitz is an up and coming winery in Odernheim in the Nahe Valley. It was founded in 2003 by the husband and wife team Louise von Racknitz-Adams and Matthias Adams. Louise von Racknitz-Adams is a winemaker by training (University Geisenheim) and she takes the lead in the cellar. Matthias Adams is a former business manager with a law degree and he takes the lead in the vineyard. Weingut von Racknitz is the former winery of the famous Disibodenberg Monastery, where Hildegard von Bingen spent 40 years of her life. Hildegard von Bingen is the first representative of the German medieval mysticism. She was active in the fields of religion, cosmology, science, philosophy, music composition, poetry, botany and linguistics. For over 200 years, winery and monastery ruins have been owned by the von Racknitz family. The vineyard area totals 15 hectares in the Rotenfels (Traisen), Königsfels (Schloßböckelheim), Kloster Disibodenberg (almost exclusive possession)(Odernheim), Hermannshöhle, Kertz, Klamm, Kieselberg (Oberhausen) and Rosenheck (Niederhausen). The heart of the vineyards is the Disibodenberg, where monks already grew vines 900 years ago. 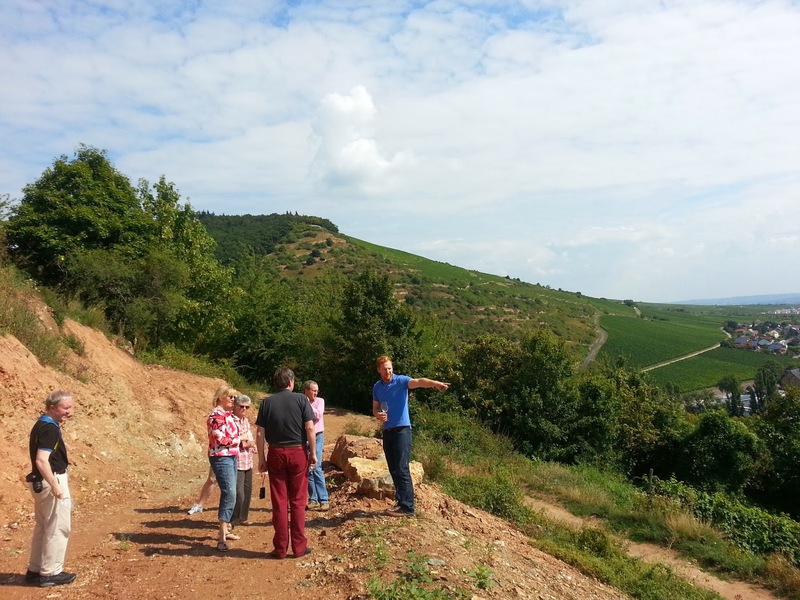 The Hermannshöhle is one of the best Riesling vineyards in Germany. In the vineyard, Matthias Adams follows an organic approach. In the wine cellar, Louise von Racknitz-Adams follows the natural wine making approach. All wines are spontaneously fermented. The wines remain in stainless steel tanks on the lees until they are bottled. The wines are grouped into 5 levels. Annual production is 4000 cases. First, Gutsweine – entry level wines. Second, Gesteinsweine – this is the second quality level where grapes are sorted according to the soil type of the vineyard: Schieferboden, Vulkangestein, Kieselstein - Slate floor, volcanic rock, pebble. Third, Traditionsweine – going back to the old days; this group includes a Silvaner Trocken, Gemengelage Trocken, which is a field blend and Glasperlenspiel, which is the lightly sparkling apple wine that Matthias Adams presented at 2014 Apfelwein Weltweit. Fifth, grand-cru Lagen Rieslings – ultra-premium dry wines from the top vineyards, including from the Niederhäuser Herrmannshöhle, which is considered to be one of the best Riesling vineyards in Germany. In addition, sixth, Weingut von Racknitz also makes Sekt (extra brut). When I got interested in “fine dining” in the 1970s, Franz Keller’s Schwarzer Adler in Oberbergen was certainly a place one had to go and eat there. Indeed, we did this many times over the years. As part of the recent pre-tour visits, Annette and I had lunch at the Schwarzer Adler and also visited the impressive, new winery of Fritz Keller, half a mile down the road from Restaurant Schwarzer Adler. The founder of the Keller Empire is the late Franz Keller. Franz Keller (1927 – 2007) probably was Germany’s most important early proponent of fully-fermented, dry wines and the use of barriques. He had 2 sons. One of them – Franz Keller - was initially the Chef of Restaurant Schwarzer Adler, but eventually moved to Hattenheim in the Rheingau, where he is the owner and chef at the Adlerwirtschaft. The other one – Fritz Keller – took over from his father in the 1980s and expanded the empire further. Today, the Keller empire comprises a luxury hotel (Hotel Schwarzer Adler in Oberbergen), 3 restaurants (the Michelin starred Schwarzer Adler, the more basic Rebstock, just across the street, and the KellerWirtschaft, which is part of the new winery), a fine wine trading company, focusing on Bordeaux and Bourgogne, Weingut Franz Keller (recently joined the VDP, the association of about 200 elite winemakers in Germany) and the Edition Fritz Keller project, a very successful trademark wine project with the discount chain Aldi. Fritz Keller, in addition to his activity as winemaker, wine trader and restaurateur, is also president of the German football club SC Freiburg. Schwarzer Adler is a truly iconic restaurant that has been founded by Franz Keller. In the 1 star Michelin category, this traditional restaurant offers a harmonious mix of Baden country charm and elegance. The menu is a successful marriage of French and German cuisine reflecting the frontier on the nearby Rhine River, which is the border between Germany and France. The impressive wine list boasts 2 600 different wines, including a good selection of bottles from both Baden and France. Fritz Keller: Elegance, style and hospitality with a perceptible French influence create an unmistakable ambiance at our Restaurant Schwarzer Adler. In the kitchens of master chef Anibal Strubinger and Hubert Pfingstag nearby France is as present as the much-lauded local Baden cuisine. The combination of both these influences at the very highest level forms the culinary character of the house. Rebstock is a more basic restaurant, just across the street of the Schwarzer Adler, which has of course different food, but the same wine list as the Schwarzer Adler. The KellerWirtschaft, which is part of the new winery, half a mile down the road from the Schwarzer Adler. Hotel Schwarzer Adler belongs to the group “Small Luxory Hotels in the World”. It is in the main building, where the restaurant Schwarzer Adler is and also has some rooms in a separate building. With the Keller family everything started with producing and offering outstanding food. Franz and his wife Irma were among the first generation of chefs to start the German revolution in the kitchen more than 50 years ago. In 1969 Franz and Irma Keller and their restaurant Schwarze Adler were awarded one Michelin star. For Franz Keller, the central idea of winemaking was to produce top quality wines that perfectly accompanied the creations in the kitchen. The current generation, Fritz and Bettina Keller have brought the winery to a new level. They just finished construction of a brand new winery that is an architectural landmark, beautifully integrated in the landscape. Their efforts to produce top wines, among them stunning Pinot Noirs, were acknowledged by their selection as new member of the VDP in 2013. Fritz Keller: Initially, everything revolved around gastronomy for the Kellers. To make wines that partner food perfectly has thus always been central to their winemaking. In vineyard and winery, just as in the kitchens of the restaurants, the greatest attention is paid to the raw materials. Only grapes of a select quality – this is our conviction – can go on to develop their own character which speaks of the terroir and the estate. Fritz Keller: Trading in fine wines has been a tradition of more than 100 years in the Keller family. To this day, the focus is on the great wines of Bordeaux and Burgundy: a unique portfolio unequalled in quality and breadth encompassing wines from the most prestigious vineyards and chateaux, completed by selected wines from other European and New World regions. It was the grandfather of the current patron Fritz Keller who started the tradition, selling Kaiserstuhl wines at the turn of the last century to the budding tourist towns and spas of the Black Forest and Alsace, returning with their local wines. Franz Keller built on his father’s efforts and forged invaluable relationships with growers in the Bordelais and in Burgundy – they form the basis of the great selection of first-rate Bordeaux and Burgundy wines that has become the hallmark of Restaurant Schwarzer Adler. Beyond that, there is a selected array of international and (a few) German wines and not least the Champagnes, Ports, Sherries and Digestifs – all of these have just one thing in common: they are of the high standard that our house aspires to. Edition Fritz Keller is a highly successful collaboration of Fritz Keller with Aldi, Germany's legendary discount food retailer. Under the brand name Edition Fritz Keller, he initially (in 2007) produced a Pinot Noir and a Pinot Blanc from Baden, contracting with a great many smaller growers of the region for grapes. In this quest to bring top-quality wine to as many people as possible, Fritz has, as the back label pompously informs us, found inspiration in the "Bauhaus" school of architecture and art. The portfolio has now expanded to more than half a dozen wines. Following her presentation at the German Wine Society in Philadelphia/South Jersey a few weeks ago, Annette Schiller, Ombiasy PR and WineTours, gave a similar presentation and led a tasting – with different wines – at the German Wine Society in Washington DC. As in Philadelphia, Annette talked about “New Developments in German Wine”, including the emerging new wine regions in the eastern part of Germany, the German red wine boom, and the new German Wine Classification, which is being pushed by the VDP, the association of about 200 German elite winemakers. She also briefly talked about the 2 wine tours coming up to Germany that she is organizing and leading. There is a red wine boom in Germany. The share of red wines in terms of production has increased from 10 percent in the 1980s to about 35 percent now in Germany. Of course, given its location, the German red wines tend to be not like the fruity red wines we know from warmer countries, but lean and more elegant, with a lot of finesse. 30 years ago, in the international scene, people would not talk about German red wine. But this has changed. Germany now produces red wines that can compete with the best of the world. Although many people think that there is only one wine classification system in Germany – the classification system of the Law of 1971 – this is not correct. There are four approaches to classifying wine in Germany. True, the classification system of the Law of 1971 with its pyramid of ripeness of the grapes at harvest (Qualitaetswein, Kabinett, Spaetlese, Auslese …) at the center is the standard classification system in Germany and the vast majority of winemakers in Germany use this approach. A large number of winemakers, however, have moved away from the standard, in particular the powerful group of German elite winemakers, the VDP (Verband Deutscher Praedikatswein Produzenten), which has conceived its own classification system. Other winemakers moved to a zero classification system – no classification, an approach very familiar in the New World. Finally, there is a fourth group of winemakers that have designed their own classification system. As in previous years, the husband and wife team Annette and Christian Schiller will personally guide the tours throughout the trip. Through our friendships with many winemaker and owners, the tours are a very intimate, personal experience for everyone in the small group (10 people maximum) traveling with us. Quintessential German Whites (Germany-North): From September 04 – September 13, 2014, we will explore six (Saale-Unstrut, Franken, Rheingau, northern Rheinhessen, Mosel, Nahe) German wine regions with visits to 19 top wineries and cultural gems. The Sun-kissed German South (Germany-South): From September 14 – September 20, 2014, we will explore three wine regions (Baden, Pfalz, southern Rheinhessen) in the south of Germany and will experience the German red wine revolution. The wines were selected by Annette Schiller. She choose 2 wines from the cellar of the German Wine Society and the remainder from the portfolio of Mac Arthur Beverages in Washington DC. 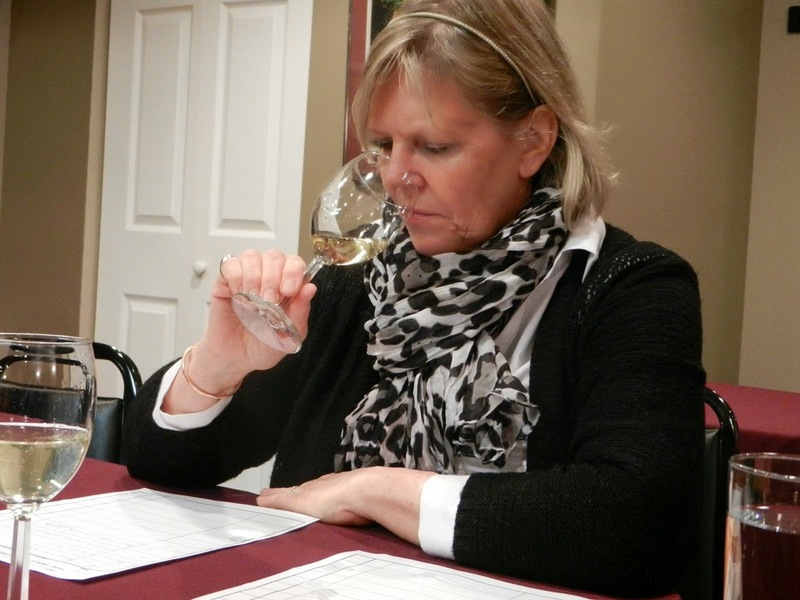 Terry Theise is one of the leading experts of German Wine in the US. Among the vast number of his followers, he has gained something like a cult status. He publishes a thick catalogue once a year with extensive comments. In addition to the compendium of exciting wine reviews, the Terry Theise’s annual catalogue is a very good introduction to German wine, both to the basics and to the current trends and issues. His wines are imported by Michael Skurnik, an importer and distributor of fine wines based in Syosset, New York. Terry also imports Austrian wine and Champagnes, including excellent grower Champagnes. If you want to learn more about Terry, the Washington Post carried an excellent article about him some time ago. See here. A few comments. First, there are no red wines, although they now account for 1/3 of the German wine output. Terry is clearly focusing on Germany’s white wines. Second, nor have I seen a category for sparkling wines; for sparklers, you have to go to his excellent portfolio of Champagnes, including many grower Champagnes. Third, his list does not include any noble-sweet wines (Beerenauslese, Trockenbeerenauslese, Eiswein). Fourth, Terry is known for having a preference for sweet-style wines, although his portfolio increasingly includes also dry wines. Fifth, as mentioned above, this is not a list based on a comprehensive review of German wine, but is limited to Terry Theise’s portfolio of winemakers, which is large and exceptional. The good news is there are plenty of good wines, a decent number of outstanding wines and a small but significant number of superb wines. My job is to find them for you, and I did my job. But another part of my job is to build and maintain trust with you, and here I run afoul of a collateral worry; I can annoy my growers if I am too blunt when they have a dud year. So I am going to tell you as much of the truth as I think you need to hear and they can bear to hear. Of course part of my job is to sell wine, and that entails being able to spin and be relentlessly positive. A grower has every right to believe I’m working on his/her behalf. I have an equal right to suggest that I am most effective for them if my customers believe me. So, watch me pick my delicate way through the thickets. When 2013 works it gives wines of great relief and contrast; these are vivid wines. They’re almost never creamy, but they are sometimes quite silky. They can seem deliciously savage at times, like a raspy-voiced singer; it isn’t a “pretty” voice but still you love it. 2013s are high in acidity and stunningly high in extract; this is tactile and discernible, not a metaphor. That said, bottling will often subdue this component, not insofar as it exists but insofar as it can be tasted. At that point extract behaves as a buffer to acidity (and to sweetness if it is there) and confers a richness to the mid-palate. 2013s are often high in botrytis, and the degree to which botrytis was managed is a leitmotif of the vintage. As such ’13 invites comparison to two previous vintages, 2010 and 2000. But it is both less ripe and not as monstrously high in acidity as ’10 was. It has in common with ’10 its tendency to an almost monumental solidity along with always-prominent (and sometimes unbalanced) acids. Regarding 2000, nearly every grower told me the conditions in ’13 were less challenging, there was less overall mildew, plus they’d learned from the earlier vintage and were better prepared this time. All of this may very well be true. The best 2000s have aged surprisingly well, but that “best” is a slim tip of a large iceberg…. The vintage is very small. Many growers made one-third of an average year. At best it was 40-50% below average, coming on the heels of the short crops of 2012 and 2010, and so every possible wine was on the table. I hate giving this to the same estate twice in a row, but truth is truth, and VON WINNING is showing that their glorious collection in 2012 was no fluke, but instead the arrival at a lofty place they shall continue to set up house in. Believe me, I wondered. Because those astonishing ‘12s might have been lavished with pixie-dust from the weightless weight of the creamy vintage style. Would the ‘13s be arch and angular again? Not a bit of it. These guys are here to stay. It is conceivable that Von Winning ‘13s will be a little tiny bit less grand than their ‘12s, but it’s definite that their ‘13s are dramatically better than almost everything around them. I spent a couple days of R&R in Burgundy, and I took a bottle of ’12 Pechstein GG as a gift to each grower I visited. “What is it like?” they asked. I looked for an easy shorthand way to say it. Imagine François Raveneau made Riesling in the Pfalz instead of Chardonnay in Chablis: That’s what it’s like. Any doubt I ever harbored about the impact of Stefan Attmann’s somewhat atavistic style of “winemaking” is now quelled. These wines are miracles. It is a markedly fine vintage at Müller-Catoir, perhaps even better then ’12, hard as that is to believe. I was also struck by the sure hand and steadily increasing polish at Kruger-Rumpf. I’ve already told you about Merkelbach. My personal darling Carl Loewen keeps having outstanding vintages. There’s a paradox in which estates who always show an intelligent hand of craftsmanship can get overlooked, just because they did it yet again. We come to expect it of them, so when they keep performing it isn’t news. But attention must be paid to the passionate diligence of Selbach-Oster and Schlossgut Diel. 2013 was especially kind to a few estates who flourished by dint of its acid-structure. These include Eugen Müller, Theo Minges, Jakob Schneider (who’s on a steady upward climb in any case) and Reuscher-Haart. Von Othegraven Kanzem Altenberg Riesling Spätlese Alte Reben. This is just an improbable miracle from this vintage, and though it won’t “create sales” as much as a less expensive nominee would, an achievement such as this must be recognized. A late-released (because long-fermented) 2012 Selbach-Oster Graacher Domprobst Riesling Spätlese Feinherb, an utter Mosel masterpiece, showing a thrilling and soulful pathway to a new/old dialect of slate-grown Riesling that you simply shouldn’t miss. (bearing in mind I selected very few Auslesen this year) Müller-Catoir Herzog Rieslaner Auslese, along with Selbach-Oster Schmitt, two utterly different wines, neither of them at all “dessert” like, each powerfully savory, each a thrall of masterly beauty. Von Winning Sauvignon Blanc, because pyrene-averse little me was quite overcome by how good this was! The entire Von Winning collection of GGs, especially….no, actually: ALL of them. Merkelbach Uerziger Würzgarten Riesling Auslese #7 (though its sister wine the “Urglück” is also an amazing bargain). The American Association of Wine Economists (AAWE) just released a new issue of the Journal of Wine Economics (JWE). The JWE, published by Cambridge University Press, is available in more than 2,300 libraries worldwide. The new issue also includes Christian G.E. Schiller's review of the book: RALF FRENZEL (ed. ): Riesling, Robert Weil. Tre Torri, Wiesbaden, Germany, 2013. Below is the table of contents of the Journal of Wine Economics, Volume 9, 2014, No. 1 and Christian G.E. Schiller's book review. A Barrel of Oil or a Bottle of Wine: How Do Global Growth Dynamics Affect Commodity Prices? RALF FRENZEL (ed. ): Riesling, Robert Weil. Tre Torri, Wiesbaden, Germany, 2013, 255 pp., ISBN 978-3-941641-94-5 (English), E49.90. This is a heavy book: it weighs almost 2 kilograms and unites two heavyweights - Riesling, arguably the best white grape variety in the world, and Weingut Robert Weil, one of the best Riesling producers in the world. 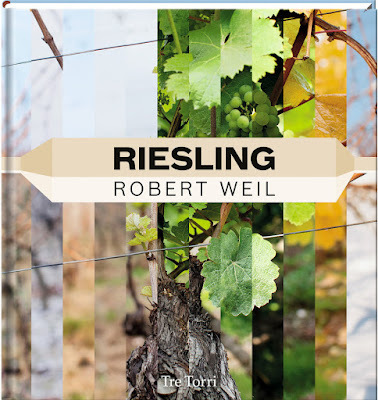 The first in a new series of books from Tre Torri, covering the most outstanding wine estates of the world, it covers the complex topic of Riesling through the example of the top German wine producer Weingut Robert Weil. Readers should not expect to be informed about the Riesling grape variety in general, as perhaps the main title, Riesling, suggests. More than half of the 255 pages are mostly wonderful pictures, and some text pages also include pictures. It is not only a book with a most interesting text but also one with great pictures of wine. Weingut Robert Weil is managed by Wilhelm Weil, who owns the winery jointly with Suntory, the Japanese beverage group. With 75 hectares - exclusively Riesling - under vine, it is one of the largest estates in Germany. The estate’s dedication to Riesling has led numerous observers of the international wine world to regard Weingut Robert Weil as a worldwide symbol of German Riesling culture. A Riesling wine of the 1893 vintage, grown on the Gräfenberg site, made the estate famous. The imperial Habsburg court in Vienna purchased 800 bottles of this wine in 1900 at 16 gold marks per bottle. Weingut Robert Weil’s top botrytized wines are sold today at very high prices—they are among the most expensive in the world. Although best known for its Noble-Sweet Rieslings, Weingut Weil produces mainly fully fermented, dry wines, including ultrapremium Grosses Gewächs (Grand Cru) wines. Five authors contributed to the book, which is divided into six chapters. Written by Editor Ralf Frenzel, Chapter 1 is the prologue, offering a portrait of Wilhelm Weil. It paints him as a winemaker who has done a lot not only for his own estate but also for the region, the famous Rheingau, and for Germany. Chapter 2 is a very detailed and well-researched account of the history ofWeingut Weil by Daniel Deckers, against the background of the Rheingau region and German wine history. Deckers discovered the world’s oldest classification map, which was prepared in 1868 by Friedrich Wilhelm von Dünkelberg and classified for the first time the vineyards of the Rheingau. Deckers describes the founding of the winery in Kiedrich by Dr. Robert Weil, who had lived and taught at the Sorbonne in Paris but was forced to leave France and return to Germany because of the Franco-Prussian War (1870–1871). He joined his brother August in Kiedrich and bought the first vineyards in 1870. In 1879, he moved into the former estate of Sir John Sutton, baronet, which remains the home of Weingut Weil . The first auction of his wines at Burg Crass in 1881 was a failure, but when the German emperor began buying the 1893 Weingut Weil Auslese, the Weil wines gained renown. In 1988, the estate was sold to Suntory, and Wilhelm Weil was appointed managing director, retaining a minority ownership share. Chapter 3, by Dieter Bartetzko, deals with the architectural ensemble of the Weil property. Sir John Sutton bought a tiny, dilapidated winegrower’s cottage in 1869 and transformed it into a small country estate in the Tudor style, which does not have to fear comparison with the original Tudor manors in Sutton’s home country of England. Thereafter, over the years, a number of new structures have been added, including the Vinothek (wine store) built with generous glass paneling that faces the courtyard, in the 1990s, and the new extension finished only recently. But the Tudor-style house built by Sutton remains the heart of the estate. The historical manor house, the ultramodern cellars and the Vinothek stand side by side in a beautiful park, reflecting the same synthesis of old and new that is in the estate’s winemaking philosophy. Chapter 4 ostensibly comprises an interview with Wilhelm Weil, centering on the question: “What makes a great Riesling?” It is not, in fact, an interview but a lecture by Weil, transcribed by Christian Goeldenboog. There are no questions, at least no explicit ones. And it is not about Riesling in general; it is about the Riesling wines produced by Weingut Weil in the Rheingau region in Germany. Wilhelm Weil is one of the vice-presidents of the Vereinigung deutscher Praedikatsweingueter (VDP), the association of about 200 elite wine producers in Germany, and the chapter also reflects the thinking of the VDP. Importantly, the VDP is in the process of radically changing the way in which German wine is classified by moving to a classification system that resembles the classification system of the Bourgogne in France, which is terroir driven. Chapter 5, by Goeldenboog, deals with the work in the vineyard and in the cellar and is divided into four subchapters. The first subchapter, “Riesling Has Style,” reads a bit like a continuation of Chapter 3 and has Wilhelm Weil talking about his winemaking approach and wines. The following subchapter, “Rock, Soil, the Rheingau and the Ecosystem,” reviews the terroir of the Rheingau in general and that of the three vineyards, where Weingut Weil owns land and grows its wines—in particular, Kiedricher Klosterberg, Kiedricher Gräfenberg, and Kiedricher Turmberg. Weingut Weil’s vineyards all belong to the group of the high-lying sites of the Rheingau: Inclination (up to 60%), exposure (southwest), and the ability of the barren stony soils to absorb heat are the factors that make for three perfect Riesling sites. These conditions, as well as ideal circulation, enable the grapes to stay on the vine for a long time, ripening well into November. Kiedricher Gräfenberg: The soil consists of deep and medium-deep stony, fragmented phyllite partially mixed with loess and loam. At the end of the twelfth century, the site was first documented as mons rhingravii (lit., the hill of the Rhine counts), and, in 1258, it was named “Grevenberg.” To this day, Gräfenberg is a focal point. The record prices it fetches at auction bear witness to the site’s renown. Kiedricher Klosterberg: The name Klosterberg (lit., monastery hill) derives from “Closterweg,” the old path that ran through this vineyard in Kiedrich en route between the monastery Kloster Eberbach and its mill near Eltville. The shallow to deep stony-gritty soils of the southwesterly facing site are of Devonian (colored slate) and pre-Devonian (phyllite and sericite gneiss) origin and are mixed with gravelly loess. Kiedricher Turmberg: After the founding of Weingut Robert Weil, the Turmberg site was always considered one of the estate’s top sites, second only to Gräfenberg. The name Turmberg (lit., tower hill) derives from the surviving central tower of the former castle Burg Scharfenstein, which stands on that site. The archbishops of Mainz had the castle built on the steep crag northeast of Kiedrich in 1160. Turmberg lies on the slopes of a steep, slaty crag. Its stony-gritty soils consist primarily of phyllite mixed with small portions of loess and loam. After passage of the wine law of 1971 and its amendment of the vineyard register, numerous traditional vineyards, like Turmberg, were incorporated into other vineyards. In 2005, the Turmberg parcel was reinstated as an individual vineyard site, measuring 3.8 ha (9.4 acres). It is owned solely by Weingut Robert Weil. The third subchapter, “Fruit—Maturity,” talks about the 12-month vineyard cycle and dwells in particular on the issue of the optimal moment to harvest the Riesling grapes (in a northern wine region). Of course, at Weingut Weil special attention is paid to work in the vineyard. Another quality factor is the low yield, achieved by restrictive pruning, thinning out the grapes twice, carrying out a negative selection at an early stage, and a selective hand-picking process. At Weingut Weil, the harvest can be spread over a period of 8 to 10 weeks. Each row of vines can be picked over up to 17 times. When botrytised grapes are picked, they are selected in the vineyard and immediately sorted into three different containers, depending on the degree of botrytis. The grapes are again selected berry for berry in the cellar. The last subchapter reviews in detail the process of alcoholic fermentation, focused more on historical aspects and less on how it is done at Weingut Weil. At Weingut Weil, vinification takes place in stainless steel tanks of varying sizes (depending on the size of an individual lot) and in traditional mature oak casks (“Rheingauer Stückfass”: 1,200 liters). Chapter 6 contains tasting notes by Caro Maurer, Master of Wine, of about 40 wines of Weingut Robert Weil, all from the Kiedricher Gräfenberg, mostly from the 1990 to 2011 vintages, ranging from ultrapremium dry Erstes Gewächs wines to luscious Noble-Sweet Trockenbeerenauslese wines. To sum up: this is a great book about Riesling. It is not a general introduction. The book tells the story of the Riesling grape through the perspective of one of the world’s top Riesling wine producers, Weingut Robert Weil from Kiedrich in Germany. It does this with many wonderful pictures from Weingut Robert Weil and the Rheingau region, and with a number of most interesting text contributions by various German Riesling experts. (1) The winery is part of the wonderfully restored, historic castle Schloss Neuweier, where wine has been made for centuries. (2) Schloss Neuweier also includes a top notch restaurant, where we will have lunch during our visit. The restaurant is in the first floor of the castle. It is owned and run by Chef Armin Roettle and his wife and since 2006 in the 1 star Michelin category. (3) Weingut Schloss Neuweier focuses on Riesling wines, which are outstanding. You would expect that in the Mosel or the Rheingau region, but not in Baden. Reflecting the special soil of the vineyards surrounding the castle and the special micro-climate there as well as a long-standing Riesling tradition and passion, Weingut Schloss Neuweier produces world class Rieslings. (4) The export share of Weingut Schloss Neuweier is negligible, which is typical for the Baden region. But this may change for Weingut Schloss Neuweier in the future and was not like this in the past. Its Mauerwein (Wall wine – from a terraced vineyard on the hill behind the castle) was one of Queen Victoria’s favorites. It had won an award at the International Exhibition of Philadelphia in 1876 and was on the airship Graf Zeppelin’s maiden flight. (5) Until recently, the driving force behind Schloss Neuweier, including Weingut Schloss Neuweier, was Gisela Joos. She and her husband, a well-known architect from Frankfurt am Main, took over the castle, including the winery, in 1992 and invested around Euro 50 million in the castle, including the winery. What you see today is essentially due to their efforts and money. In 1999, Weingut Neuweier was admitted to the prestigious VDP association, when Gisela Joos was in charge. (6) Today, the “Schlossherr” (owner) of Schloss Neuweier and the winemaker at Weingut Schloss Neuweier is Robert Schaetzle. His family acquired the estate in 2012. The senior management of the winery of course changed with Robert taking over. The already high quality level of the wines was definitely maintained if not increased by Robert Schaetzle. The Joos family is still living in the castle, but on a lease basis. Also, the lease of the 1 star restaurant was not affected by the change in ownership. When we arrived, Robert suggested to walk over to the vineyards first. While walking there, he introduced us to the rich history of Schloss Neuweier. The castle belongs to the few historic buildings from the 12th century that still exist. Die Ritter von Bach were the first who started planting vines and producing wine. All subsequent owners showed interested in winemaking. Its current shape took the castle, when it was owned by Philipp Kämmerer von Worms, called von Dalberg. During 1548 to 1549, this gentleman created the castle as you can see it today. To remind everyone of his creation he put in the entry portal: Zeyt bryngt Rosen – Time brings Roses. In 1615, the castle was passed onto the second daughter of Philipp von Dalberg, whose husband was Wolf von Eltz and Knebel von Katzenellenbogen. Katzenellenbogen was a high ranking knight who fought under the rule of the Archbishop of Mainz. He also was an important person in terms of winemaking at Weingut Schloss Neuweier. He brought his knowledge from the Franken area, the Bocksbeutel bottles and the Niersteiner and the Laubenheimer grape varities, which replaced the traditional Elblinger and Ortlieber. During the 19th century the castle changed its owners quiet frequently. From 1869, the Rößler family from Baden-Baden became the owner of the castle. The Rößler family is responsible for the Mauerberg vineyard gaining international recognition. The Joos family bought the estate including all the buildings and the vineyard in 1992. With great enthusiasm and financial investments they brought the castle and all the attached buildings back to the full bloom, which you can still admire today. The renovations were completed in 2009. In 2012, the estate was sold to the family of Robert Schaetzle; they come from a traditional vintners background in the Kaiserstuhl area near Freiburg. The heart of the vineyard area (15 hectares) of Weingut Schloss Neuweier are two very steep monopoly sites: Schlossberg and Goldenes Loch. Robert Schaetzle: Schlossberg - This is a monopoly site of 3 hectares of south-facing slopes with up to 55°incline, entirely Riesling. The soil is very special, made up of ground granite, schist, shale and slate. Due to being close to an extinct volcano you also find quartz crystals on the surface. The climate is defined by being on the lower slopes of the Black Forrest Mountains and close to the Rhine plateau and in combination with the soil is ideal growing grounds for Riesling. The Riesling grown here gets a lot of sun during the day and at night the release of the heat that was accumulated during the day in the soil. Goldenes Loch - Another monopoly site of 1 hectare south-west facing cauldron between the Schlossberg and the Mauerberg. The name was established because of the foliage glowing golden in the autumn sun due to the concave mirror effect caused by the cauldron, catching the last rays of the day. The extreme incline of 60° or more was the main reason it was left alone but in 1993 the land was reclaimed by using small diagonal terraces. The grapes grown here produce exquisite Riesling wines. Mauerberg: This is a south facing site. Historically, 60% of the Mauerberg was terraced, with each terrace large enough for one or two vines. The man-high natural stone walls contribute to the micro climate for the vines by keeping the warmth during the day as well as being dried be the wind from the Black Forest. Heiligenstein: The name seems to originate from the Celtic culture stating a magical powerful place, which it is still today. The foundation is full of granite being enjoyed by our young Pinot Noir vines. Here is where we get our very clean, clear classical red wines from. Robert showed us the wine cellar. Robert Schaetzle is a very interesting and charming fellow, with curly, almost Afro-style hair and a strong regional southern Baden accent. He lives at the castle with his French wife and one son, if I remember correctly. Robert has not appeared out of nowhere. He has put in time at serious wineries over the years – at Franz Keller and Dr. Heger in Baden, across the Rhine in Alsace with Zind-Humbrecht and Marc Kreydenweiss, and in Bordeaux at La Tour de By. Before turning to wine, Robert was in academia. He studied at Université Bordeaux Segalen in France. During the time of Jacoba Stoltenberg Rössler, the last owner of the Baden-Baden family, who died in 1984, a “Besenwirtschaft” (basic wine tavern, where the winemaker sells his own wine) was opened that over time developed into a fine dining restaurant. Today, Röttele’s Restaurant and Residence at Schloss Neuweier is a restaurant well-known in Germany. Robert Schaetzle: We were very lucky that in the year 2005 the family Röttele took on the restaurant on the ground floor of the castle. Mr. Röttele is a very inspiring and inventive Chef whose creations leaves your mouth watering. Mr. Röttele’s talent was internationally recognized so it was not surprise that he gained 1 Star from the Michelin in 2006. Thanks Robert and see you again in September 2014 on the The Sun-kissed German South (Germany-South) Tour by ombiasy PR and WineTours.